Carlotta Brentan as the ex-wife, R: Giulia Bisinella as the fiancee. Photo by Jonathan Slaff. Something old, something new. That old saw is quite apt for Mario Fratti’s double bill of one-acters at Theater for the New City. Fratti’s Wives is making its world premiere and his breakthrough The Academy returns to the boards with actor-director Stephen Morrow playing the Professor. 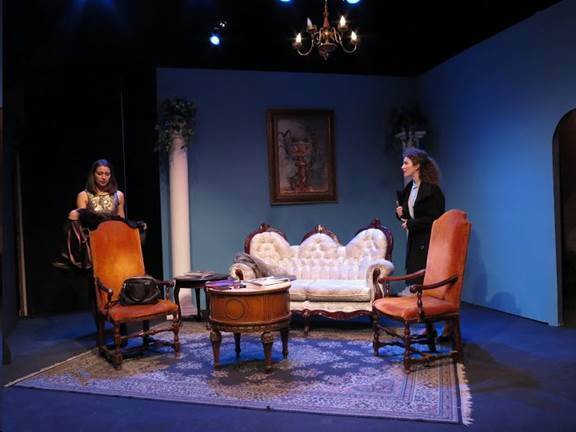 Both plays explore the battle of the sexes, and, though set in different time periods, illustrate that women and men are seldom at peace with each other. The first offering is Wives—and I’m pleased to say that this playlet will charm anyone who drops by during its run. In this two-hander, we meet two American women who refuse to be victimized by a serious philanderer named Albert. The plot is slim but its undercurrents go deep. The time is the present, and the place is New York City. As the play opens, Albert’s attractive thirty-five year old ex-wife has invited his twenty-five year old fiancée to her posh city apartment. The two characters are impersonally named The Third and The Fourth, a sure nod to Albert’s wandering eye and penchant to changing wives like his shoes. The past, present, and future mingle wonderfully in this vignette! The third wife unsparingly confides in the soon-to-be fourth wife. And, unsurprisingly, she opens the floodgates of the past by revealing to her young visitor the details of Albert’s extra-marital affairs. The younger woman listens attentively, keeping a poker face at first. However, her expression soon clouds over as the ex-wife presents more and more episodes from her defunct marriage. Albert’s fiancée eventually edges into the conversation by revealing her own insecurities and growing pre-nuptial nerves. Little surprise that by play’s end, their verbal exchanges have become a subtle war dance against Albert. No mawkish sentimentality here—but you will see plenty of grit in these two women. Admittedly, Fratti’s premise isn’t entirely original. But, under Stephan Morrow’s able direction, Mark Marcante’s set design, Alex Bartenieff’s lighting, and Litza Colon artwork, the play comes alive just fine. Actor Carlotta Brentan plays The Third with stern sophistication, and Italian-born actor Giulia Brentan inhabits The Fourth with equal parts of naiveté and growing womanly assurance. Both actors were in Fratti’s Six Passionate Women last season, which likely explains why they seem quite at home in this new play. L to R: Michael Striano, Nick Palazzo, Taylor Petracek, Kellan Peavy, Fergus Scully, Tucker Lewis, Kate Rose Reynolds, Stephan Morrow. Photo by Jonathan Slaff. The second half of the double-bill is The Academy, the play that thrust Fratti squarely into the limelight of the Italian theater world. Fratti wrote it in Italian in 1961 before later translating it into its English version. But even in its English version, the Italian language is retained in certain episodes, giving it undeniable authenticity. Is it dated? Well, it is dated in the sense that it harks back to the postwar malaise that infected Europe after World War II. But The Academy truly transcends its time period by speaking to the eternal—and ever-fascinating--battle between the sexes. The plot is well-thought out. 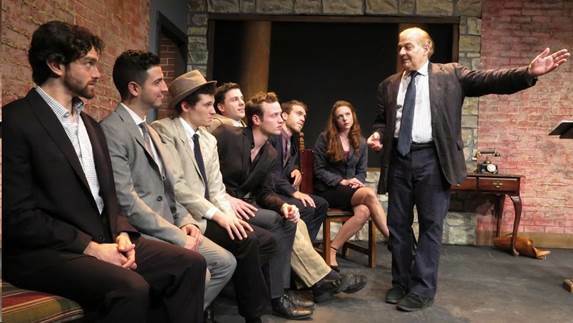 Set in 1950 Venice, it’s about a reactionary professor (Stephan Morrow) who has founded an “academy” to instruct young Italian men (Afro/Michael Striano, Benito/Taylor Petracek, Corso/Tucker Lewis, Donato/Fergus Scully, Elio/Nick Palazzo, and Fortunato/ Kellan Peavy) on the subtleties of seducing affluent American women. The young men, gigolos all, are eager to learn the game that will allow them to get the upper hand with desirable American women—and gain their purse strings as well. The play is witty, comic, and political as you please. The suave Professor intensively schools his protégés in the fundamentals of American geography, history, and rhetoric, not to mention a mini-language lesson (translating Italian to English has never been executed with such split-second timing!) Yes, it’s all very amusing to watch. But one never forgets the high stakes for the young men and the political underpinnings here. Besides mastering the academic rigors, all the young men must be approved by the Signora, the Professor’s wife (Katie Rose Reynolds). She purportedly is the personification of the postwar nation. But I am not so sure that this conceit comes across clearly in this production. All the same, she obviously exerts much influence over the six students, and all want to please her. First staged at the Theatre de Lys in 1963, this playlet is being mounted here with much clarity. The acting of the 8-member ensemble is sturdy. And considering that it’s being mounted on a shoe-string budget, the creative team do an admirable job. Mark Marcante’s minimalist set, Alex Bartenieff’s lighting, and Litza Colon‘s artwork conjure up a dusty postwar classroom in a few creative strokes: a dais, two chairs, a school bench, and classroom paraphernalia. And, oh yes. Morrow does double-duty here as director and actor. After helming so many Fratti productions in recent years, it’s a real treat to see him on the other side of the footlights as the Professor. And he doesn’t disappoint in this plum role. True, Fratti is best-known for his play that morphed into the Broadway mega-hit Nine. But there’s more to this playwright than his most prominent work. His plays have been staged in over 700 theaters in 19 languages. What’s more, some of his plays have been published in 28 Unpredictable Plays by Mario Fratti. So why not see Fratti’s current double-bill, clocking in at just eighty minutes, and get a good look at the battle of the sexes in these two bite-sized dramas? This production has no bells and whistles or special effects, but with tickets priced at only $12, you can’t go wrong. At Theater for the New City, located at 155 First Avenue. Running time: 80 minutes with one intermission.